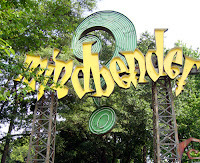 wanderlust ATLANTA: Six Flags Over Georgia: Up, Down, Upside-down…It’s All Fun! 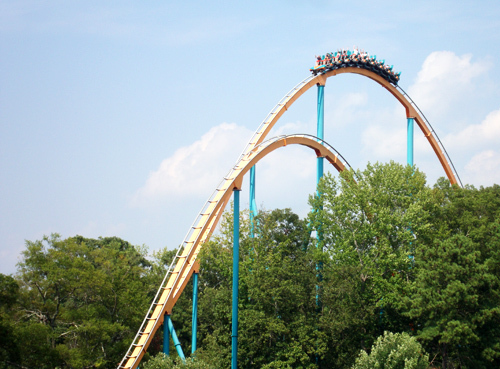 Six Flags Over Georgia: Up, Down, Upside-down…It’s All Fun! 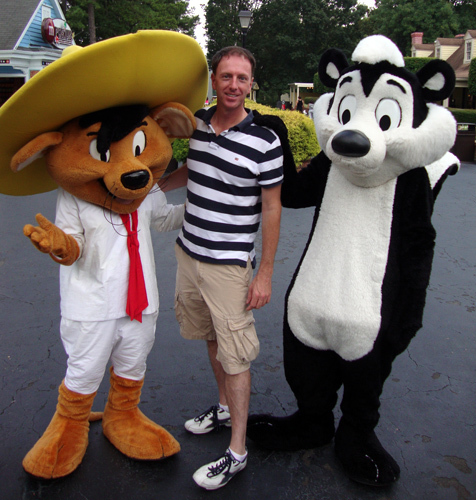 I went with a friend last weekend to Six Flags Over Georgia. It was my first time in more than a decade and it was more fun than I’ve ever had being tossed around, being held upside-down, and being dropped hundreds of feet. We arrived early to beat the lines (a great tip from fellow blogger Sue at “Field Trips with Sue”). A wise strategy, but for some odd reason, the lines never got crazy long. 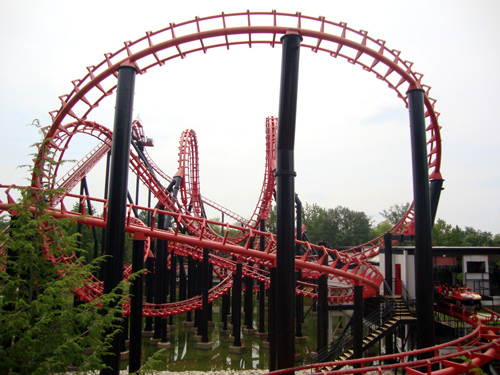 In fact, we were able to ride in the front car of the first four roller coasters we got on, with little or zero waiting! Sue recommends arriving early and heading to the back of the park first. That strategy should ensure the least amount of time spent waiting in line, at least early in the day. 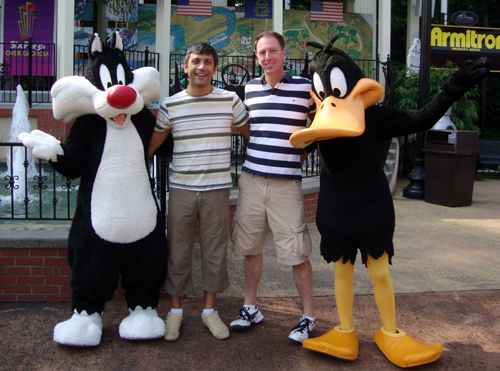 While great advice, I was so ready to ride their newest roller coaster—the Dare Devil Dive Coaster—that we headed straight for that one…well, right after a photo-op with Sylvester and Daffy, that is. I had warned my friend that I would be making photos like a first-time tourist and gave him the option to “refocus” me on the fun at hand should I get too engrossed in photo making and video taking. Oh, and I tweeted throughout the day, too. My friend graciously let me do my thing. 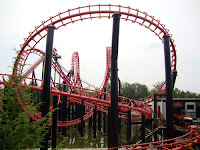 We got to Dare Devil, passing a few other coasters and screaming riders, and miraculously there were only a few people in line! We waited one load-in and then we were on the ride. 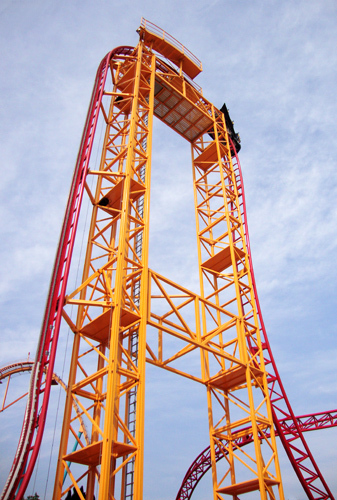 The cool feature about Dare Devil is its highest drop. It doesn’t go straight down…it actually dives more than 90 degrees AND it drops faster than gravity! While in that corner of the Park, we rode Batman: The Ride, Mind Bender, and The Georgia Scorcher. At this point, the cereal I’d had for breakfast was wearing off, but I wasn’t about to blockade the onslaught of roller coasters…they were, after all, the reason we were there. The fifth coaster: Goliath! 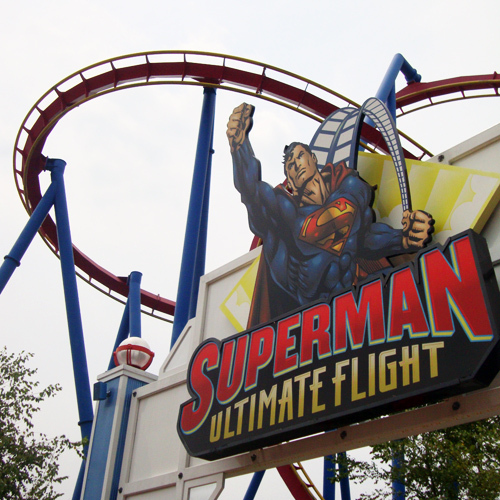 Its name tells you the most important aspect you need to know about this coaster. 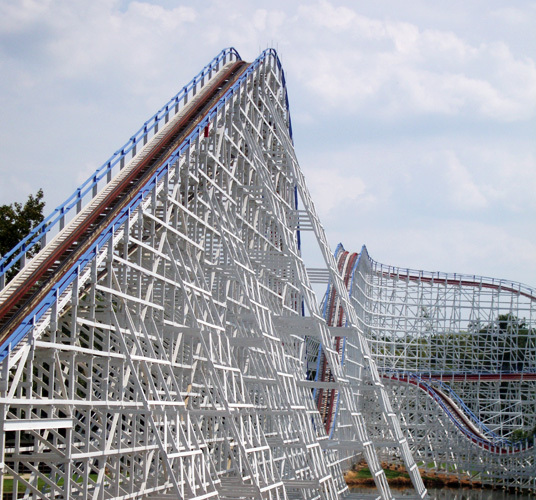 Having been in the front seat of the first four coasters, we were ready to change things up a bit. For Goliath, we took the very back seat. We got some amazing views of the Atlanta skyline as well as the jostling heads in front of us…both with their respective entertainment values. On the way to the back of the Park, we stopped for a Diet Coke and some fries, to settle my nausea, which also positioned us get a couple more coasters in before lunch. Before our next roller coaster ride, my friend wanted to ride the Wheelie. I instantly had nightmarish flashbacks to childhood. I recalled riding the Himalaya in Jacksonville, Florida…a ride that put me in shock for about 20 minutes, much to the dismay of my mother. But, being the adventurer that I am, as well as a good sport (my friend was after all putting up with my camera, video camera, tweeting, etc. ), I got on board. After a brief respite from spinning, up and down, we headed to Ninja. 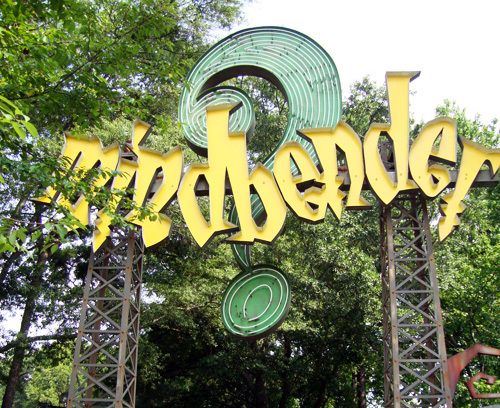 I lived in Atlanta when Ninja first opened and remember that on the first visit to the Park that summer, that was the first coaster I rode…so, maybe in some ways I am a creature of habit. Ninja was as much fun as I remembered and it’s weathered the years quite well, other than a little fading of her once bright red paint. I was actually surprised at just how smooth the newer coasters ride compared to the ones that have been around for decades, especially the wooden ones. Major improvements in coaster technology and design, I suppose. It’s appreciated whatever it is. It’s great to concentrate on the sensations the ride offers instead of wondering if my doctor is available to treat a case of whiplash. Thanks for the upgrades, Six Flags! For lunch we went to Big Mo’s On The Square for some “Southern fried chicken,” taking the “When in Rome” approach. 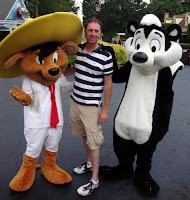 I was very impressed with how polite and friendly the Park staff were…and entertaining too. We’d passed the Riverview Carousel earlier and I’d confessed to my friend that I’m just a big kid when it comes to things like that. Using the ruse of needing photographs for tourATLANTA, I lured him to the Carousel. Of course we ended up riding…it’d be such a shame to go all that way and not enjoy it! The Riverview Carousel, listed on the National Register of Historic Places, was built in 1908 for Riverview Park in Chicago, Illinois. 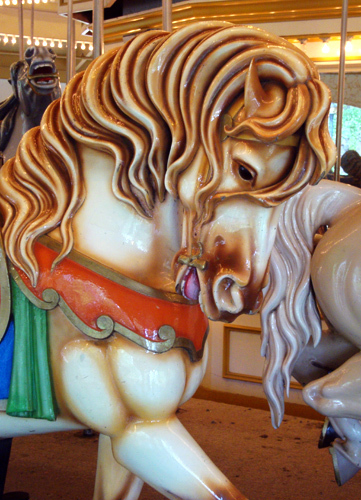 It has 70 wooden horses of varying styles and several other ride options. It is one of only a few five-abreast carousels in the world. And it’s absolutely stunning. Bumper cars. Does one even have to say how much fun bumper cars are? It was the one ride that as soon as it was over, practically every kid in the place jumped out and ran as quickly as they could to get back in line for another go. Probably one of my favorite rides after this visit to Six Flags is Acrophobia, which is the name for the condition suffered by those who have a horrible fear of heights. 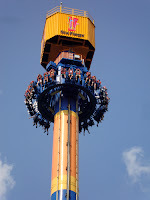 Aptly named, Acrophobia towers 400 feet high, higher than the Leaning Tower of Pisa. Rising from the ground, like the great Phoenix, the “donut” of riders spins around. Again, some great views of the Atlanta skyline were given, undoubtedly to distract us from the ascent, which was abruptly interrupted when we reached the top and our chairs were tilted 15 degrees…toward the ground! On the way up, the ride operator sings cute little songs. (Almost) all the songs end with, “Goodbye!” after which the clamping mechanism is released and the rest of the Park is treated to blood-curdling screams of riders who are very soon to be reacquainted with the ground. This ride is so much fun we went back for another turn later. Well, we decided we couldn’t leave the Park without riding The Great American Scream Machine…no matter how old she is. Probably the roughest ride in the Park, it was great to ride again. There’s something very settling about nostalgia. Fatigue creeping into the day, we headed toward the main gate. But we weren’t quite done. The Georgia Cyclone was right next to the front gate, so it became part of our exit strategy. 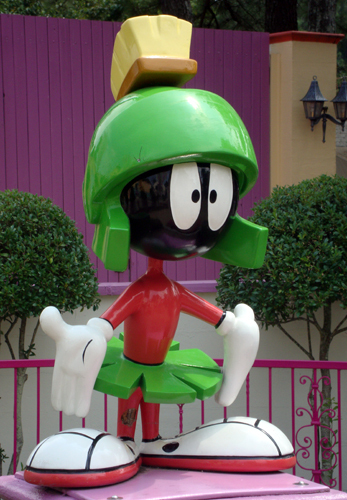 Even with all the photos (hundreds), the video, and the tweets, I don’t remember every ride and diversion we took, but included were: a train ride, a show by the Looney Tunes characters, more photos with Looney Tunes characters, ice cream, Buggs Bunny World, and a ride through the Monster Mansion. 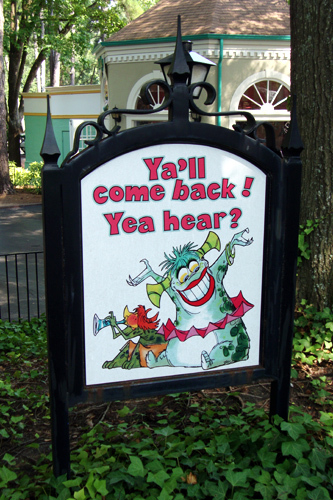 We’d said at the beginning that we’d forego the water rides available to us, but that if we decided we wanted to go on any, it would be toward the end of the day. Now it was the end of the day but instead of riding a water ride, we went back for that second ride on Acrophobia…an exhilarating way to end our day at Six Flags. Am I ready, willing, and able to have my world turned upside down again? Bring it on! I love roller coasters and other fans of them will have a blast at Six Flags Over Georgia. I’ll probably go back in October (1st-30th) for their Fright Fest and I’m already looking forward to the opening next spring. Cost: A one-day pass is $39.99, but there are online discounts and coupons all over town!